Should everyone be crying for people that have received tax bills? Should everyone be worried about the Inland Revenue chasing more people for tax? Or should we all just bury our heads in the sand and hope that the problem will disappear? There are lots of thorny issues floating around these questions. Many of which have been raised in recent press articles - Like, should financial advisers have given tax advice on pension transfers? And what ways can people pay the tax bills the Inland Revenue are sending? 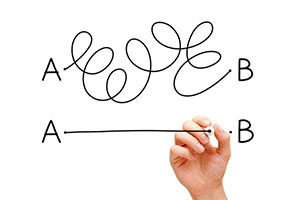 The history of pension transfers in New Zealand can be split into two periods: before the 1 April 2014 tax changes, and; after the tax changes. The infographic below attempts to simply and in general terms capture the state of the nation in each of these periods. In a nutshell, before the changes anyone with a UK pension had to notify the Inland Revenue of it and pay tax on the gain in value every year. So there is no confusion this was for any pension regardless of whether or not it was in payment. So if Cheryl had an NHS pension, for example, every year she would have written to the NHS and asked them to send a valuation of her plan. She would then work out how much it had gone up by and put that value as income in her tax return. Even though she could not access that pension she had a yearly tax liability on it. Because Cheryl, and many like her, never thought that having a pension not in payment would lead to a tax liability they never returned anything in their tax return. The Inland Revenue woke up to this and realised that the current system was not working. They thought that they would introduce a new system that got rid of this yearly requirement and simplified everything. The new system would only tax when a payment was made out of a UK pension scheme, that are usually an income payment or a transfer to a New Zealand scheme. Income payments are already covered under income tax rules. That just left them with a new system to develop for taxing pension transfers. 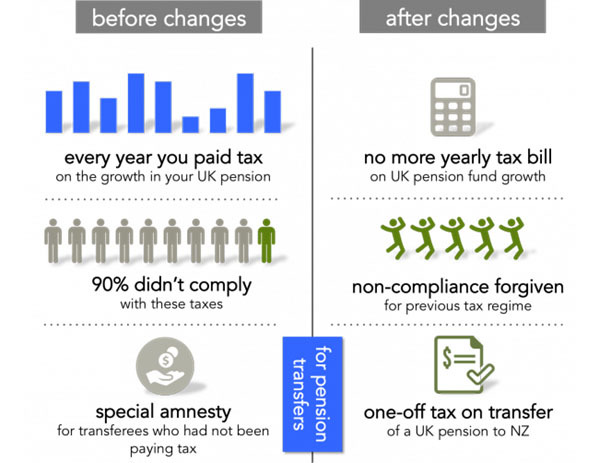 The solution they developed was pretty clear that tax would only apply when a UK pension transfer arrived in New Zealand. The system for calculating and paying the tax is, however, confusing and a subject for another day. So is the Inland Revenue being mean? The solution that the Inland Revenue came up with was to let everyone either sort out their old tax situation or declare under an ‘amnesty’. The ‘amnesty’ let’s people declare 15% of their transfer as income and then pay tax on it. For someone who had been in New Zealand a long time this looked like a good deal compared with having to calculate years of back tax. So the Inland Revenue sent out notices to people telling them to cough up on the previous transfers at the ‘amnesty’ rates. These letters have been sent as very few people had volunteered to pay under the ‘amnesty’ – to be fair the Inland Revenue never really people know about it. So getting back to some of the original questions. The main one going around seems to be the blame game for who should have told people the Inland Revenue was about to send a letter asking for a whole lotta cash. People have blamed the financial advisers, the schemes that they transferred into and whole lot of others. At the end of the day everyone before 1 April 2014 had an obligation to be declaring his or her holding in a UK pension while it was in the UK. ‘No one else did’ or ‘I didn’t know about it’ are not valid defenses for not paying the tax. So people can either take the ‘amnesty’ or calculate the tax they should have paid. For everyone that has not transferred their UK pension to New Zealand the tax rules are now simplier and you can assess them as part of the transfer decision. Any qualified pension transfer specialist will let their clients know what their tax liability on the pension transfer will be (under two methods) and how they will have to pay the tax. It is important to know this as it effects many people’s decisions on pension transfers. If you have received a notice of audit from the IRD you should know that there are many potential avenues for you to follow to get resolution on it and the best place to start is either an expert tax adviser or pension specialist. Simon Swallow is a director of Charter Square. You can contact him here. the question I have that does not seem to be addressed here is was the pension scheme taxed in the UK? If so, the IRD is being mean. If not then why should the recipients of the scheme expect their investment to be tax free? Hi Murray, the UK taxes pensions on the basis of E-E-T. This means that contributions are tax exempt (up to an annual limit), growth in the funds are exempt, and the funds are taxed as income when paid out. Therefore, prior to a transfer no tax has usually been levied on the pension funds in the UK. The double tax treaty for pensions covers the income. This states that the pension income is only taxable in the country that you live in, that is New Zealand. However, many people believe that as they are paying tax on the pension income in the United Kingdom that this can be offset against the tax that they pay in New Zealand. That is not the case. Simply put you must go through the trouble of declaring yourself non-resident in the UK and then informing your pension scheme in the UK (they will then have to register as an exempt scheme and will not deduct tax from the payments that they make to you). You will then have to declare and pay tax on the income received from the UK scheme in New Zealand. If the UK scheme do deduct tax at source before paying you you will have to apply to the HMRC in the UK for a tax rebate (good luck), but you will still have an obligation to report the gross income in your New Zealand tax return. A transfer has an entirely different set of tax rules applied to it (as discussed in the article) but once the funds are in New Zealand any payment out of the scheme is considered a return of capital and therefore tax free. Generally, no the pension in the UK would not have been taxed. They are usually taxed when the pension is drawn. The issue some people have when transferring is IRD want you to pay the tax there and then on funds you can't access. e.g. you transfer $100,000 pension, IRD wants $15k. But you can't take that 15k from your pension, you need to have it sitting around. That's what I've heard of in the past, though I hear it is changing....who knows. What about German super where it's your taxed money that you put in and when you come to NZ they take away from your NZ Super allowance dollar for dollar, German super is like kiwisaver and is not a government pension so why are we penalized? U.S. social security pension is exactly the same situation. That is as it should be. Why do you expect to claim the full NZ Super if you didn't contribute over a full earnings lifetime? If they didn't have this rule it would be unfair to those who didn't travel or didn't immigrate here. If you want the full German / US / UK / AU benefits you just need to retire in those countries and abide by their rules. Unless its changed essentially that is what happens. In my understanding the issue is that a person has NZ super entitlement X as well as e.g. a gross (before tax!) German pension entitlement Y. The NZ govt subtracts Y from X. The German govt subtracts German tax Z from Y. In effect the mixed pensioner ends up with X - Z. In other words, he or she would have been better off not getting anything from Germany. To my knowledge some affected pensionists even chosen to give up their German pension entitlement altogether, so that they do not end up out of pocket. Great outcome for NZ, isnt it? Isnt is strange that in a globalized world there is a lot of effort and data exchange on collecting taxes, but ZERO is done to make taxation compliance easier or to sort out the ubiquitous pension mess. So you are right, we should sit on our bums and not work anywhere else so that we do not get punished by 19th century double taxation agreements and the lack of social security agreements. and lets not forget that we only know about the German/Uk etc pensions to offset due to recipricol agreements. At some pont someone will wake up to the fact that many (most) are now coming from countries wheer we have no exchange of information of this type. Great for wff/benefits. So how do we income/asset test these growing and ageing migrants? How do we deal with such person who leaves the family back here on benefit support and head back overseas to earn income? You say "they take away from your NZ Super"
Who is they? The German fund or the NZ Fund? In other words: it is a total rort. It is an utter crap system based on laws from the 19th century. annoyingly this is your money, you contribute as it comes out of your salary directly as a separate 9% fee, and before 5 years you can take it out 100%, but after 5 years it gets locked in and then NZ and DE do the double screw on YOUR money??? Why would any government benefit be taxed? Is not all that money already claimed from taxes only to then be spent again for living costs, thus taxed again (gst/vat) anyway? When I retired here in 2003 from the UK, I retained an accountant to do my tax returns. His advice was that there was no need to declare it,as I was not taking an income. Some years on, I began taking an income and put this on my return and paid NZ tax on that amount. I was fortunate to find out several years ago that the rules were going to change and transferred my fund before the 2014 cut-off date. I subsequently paid my 15% 'amnesty' tax bill. There was almost no publicity on these changes andI feel very sorry for those who have been taken by surprise by the tax demands and their inability to fund them from the pension fund.